Cape Town’s design districts range from the bohemian Long Street to the trendy East Central Precinct, and quaint seaside Kalk Bay to Victorian Wynberg. Our hometown teems with creatively designed neighbourhoods. Home to innovations such as the Freeworld Design Centre and the Mutual Building in the CBD, and Etafeni Centre in Nyanga, Cape Town is a showcase of design we can be proud of. Working in synergy is something our design districts do well and it’s not uncommon to find a product created by someone from Woodstock on display in one of the designer stores in De Waterkant. With the rise of new creative industries and districts like The Fringe, there will be more of these symbiotic relationships. Renowned for its entertainment venues and laid-back vibe, Long Street is also a living design legend. Along its significant length, you will find restored Victorian buildings that have been converted into nightclubs; theatres and boutique hotels; a “green” mall (210 on Long is home to green goods retailers); furniture, clothing and craft stores; restaurants; a financial hub and more. Cutting-edge technology, fashion and design are synonymous with Kloof Street. Visitors to this long, winding road in Gardens will find casting and production studios, the Labia cinema art house, offices for national broadcaster e.tv, trendsetting hair salons, as well as Clockwork Zoo, South Africa’s biggest animation studio. On the slopes of Signal Hill and within walking distance of the City Centre, vibrant De Waterkant is the epitome of design in the Mother City. This trendy neighbourhood, characterised by renovated 18th-century buildings, lays claim to the Cape Quarter Lifestyle Village (built on two of the neighbourhood’s previously neglected blocks). In addition to the premier decor brands that trade in the village, there are numerous art galleries, restaurants and antique shops in the area. It’s amazing what an influx of creatives, a new name and an architectural facelift can do for Cape Town’s previously neglected Central City. Now known as the East City Precinct, this revamped neighbourhood is home to many design and information technology firms, including Zulu Mama Chair creator Haldane Martin. With an inspirational project – The Fringe: Cape Town’s Innovation Hub – in progress and aimed at attracting more creative industries and emerging designers to the area, the Easy City Precinct is a design district frontrunner. Design includes many aspects and these are featured prominently in The Fringe, Cape Town’s innovation district. Within its stylish borders, from Roeland to Tenant streets in the City Centre, The Fringe boasts an impressive array of creative and inspirational businesses, buildings and institutions, including the Fugard Theatre, the Cape Craft Design Institute, Open Innovation Studios. Whether you’re a card-carrying member of the Cape Fashion Council, a regular patron of the Book Lounge, a student of fashion, graphic design or engineering at the Cape Peninsula University of Technology, or have a weakness for Charly’s Bakery’s designer cupcakes, you’re sure to find yourself at the heart of the city’s innovative streak in The Fringe. Easily recognisable by the Victorian- and mock-Tudor-style houses that dominate the area, as well as the picturesque Maynardville Open Air Theatre, it is not entirely impossible to feel as if you’re living in a different era in Chelsea Village. However, pottery stores, a busy shopping centre, top interior decorators and a variety of tasty restaurants also present a distinctly modern feel to the area. 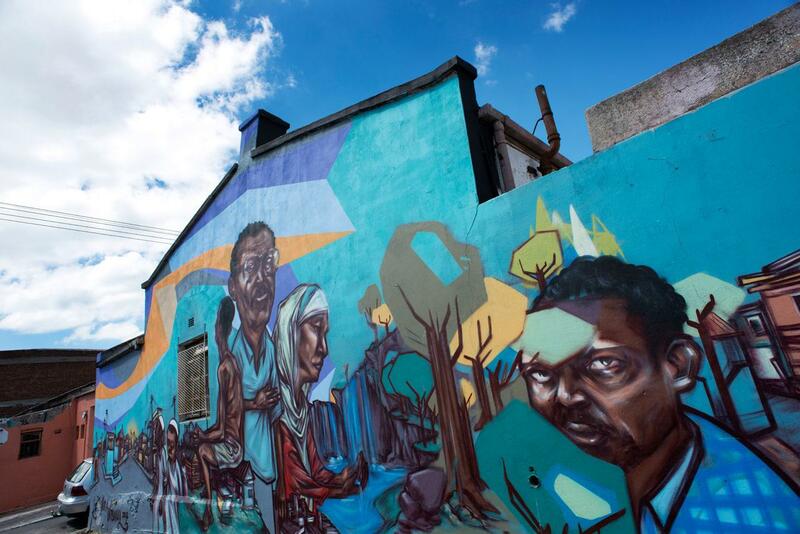 Remodelling in the townships has turned browsing in Langa’s Washington Street into a must-do when visiting the Mother City. Versatility is Washington Street’s primary appeal and you will find everything from the Eziko Cooking School, housed in a repurposed Safmarine sea freight container, and the Guga s’Thebe Arts and Culture Centre, designed by award-winning architect Carin Smuts, to the environmentally conscious Tsoga Environmental Resource Centre and the delectable Imbizo Lounge and Restaurant on its sidewalks. Kalk Bay is proof that great designs can turn a simple fishing village into a visual hotspot. With a diverse heritage, an eclectic mix of vintage homes, markets and galleries, and a thriving artistic community, (many writers, filmmakers and other creatives have put down roots here), this little village offers a creative experience like no other. There’s more to the peaceful suburb of Bellville than meets the eye. Home to the magnificently designed Tyger Waterfront, a shopping complex, the informative Bellville Library and the Rust en Vreugd Art Gallery, Bellville is also the birthplace of the Mother City’s zef (common ) culture. Local rock groups and artists including Die Antwoord, aKing, Jack Parow and Fokofpolisiekar are all proud sons of Bellville. At the forefront of cyber-design is the Silicon Cape Initiative in Cape Town. A digital ecosystem that connects vital members, including entrepreneurs, investors and IT specialists, Silicon Cape is a pioneer and champion of the Mother City’s highly regarded information technology capabilities. With its rich vineyards and awe-inspiring mountains, Stellenbosch provides the perfect vistas for photographers and cinematographers. Already the queen of viticulture, with its proud history of producing world-class wines since 1690, and renowned for its prestigious university, Stellenbosch is now also the home of the Cape Town Film Studios. With filming in the Mother City gaining popularity by the day, development of the film studios is a top priority, sure to increase the already substantial design allure of the winelands.